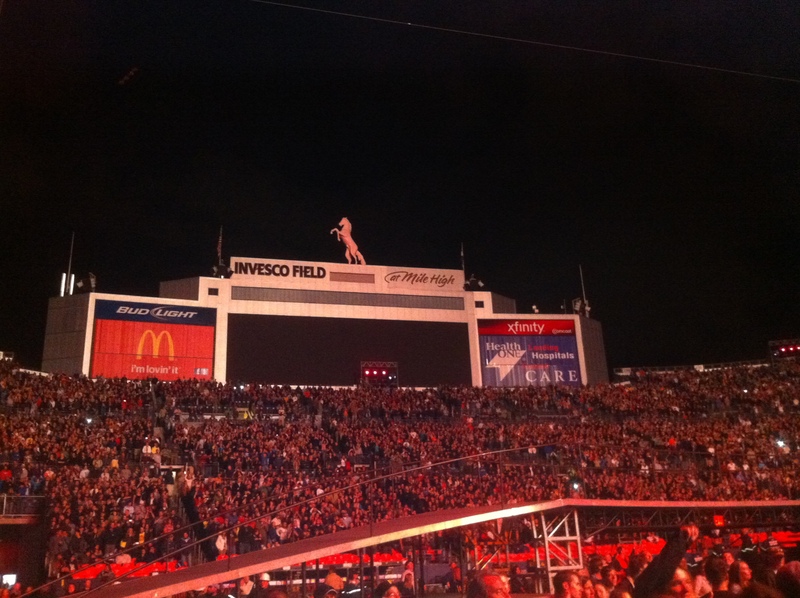 U2 360 in Denver was a fantastic show – a great way to open this US leg of the 360 tour. It was a great set list that included Pride, All I Want is You, Stay, Zooropa, Scarlet, Hold Me Thrill Me Kiss Me Kill Me and Even Better Than the Real Thing. It was the first time I had heard Zooropa and Scarlet, and it has been a while since I’ve heard All I Want is You, Even Better Than the Real Thing and Hold Me Thrill Me Kiss Me Kill Me. 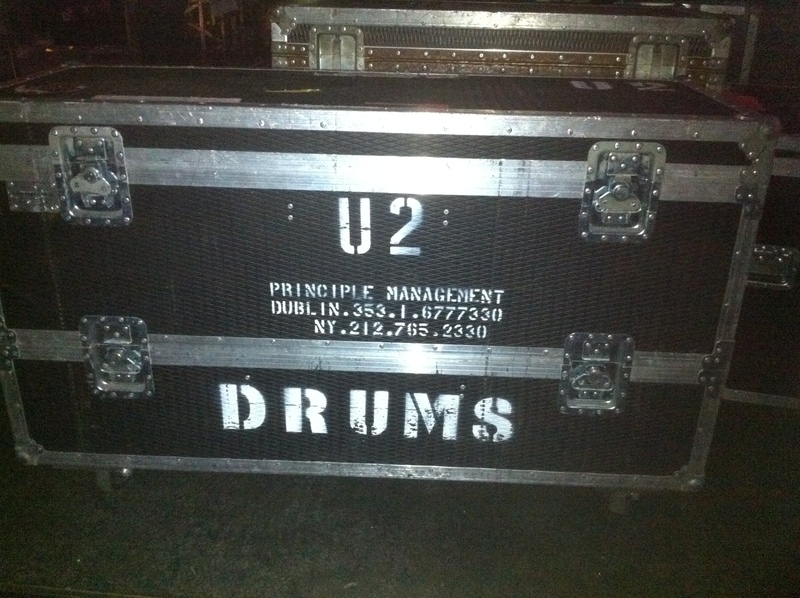 I was very disappointed U2 didn’t play my favorite I Still Haven’t Found What I’m Looking For, but they did play Pride. And judging from my reaction when it started, Pride is going back into my top 5 U2 songs. It was a great set list and the band seemed really into the show, but the audience wasn’t overly enthusiastic – especially for opening night. Maybe Denver is just more mellow than the East Coast shows I’m used to. After a good night’s sleep, I woke up Saturday morning to find the GA line had moved to outside of my window of my hotel room. Elvis, Cilla and I hung out in the GA line for a while. It was quite warm because it was sunny with no shade on the cement parking lot. I saw a bunch of my friends from the Elevation tour and a lot of new ones I’ve made this year on Twitter and Facebook. 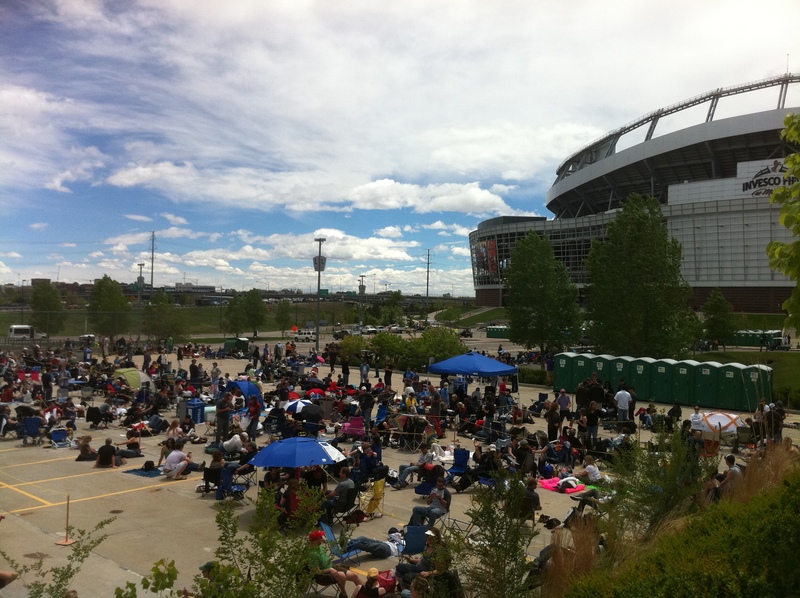 After a short nap, I went back over to Invesco Field around 4 and waited for the band to arrive. Bono and Edge arrived after 5:30. They both got out and signed for the fans. Then Larry and Adam drove by, but did not stop – they didn’t even roll down the window or wave. I casually walked in the GA entrance after 6pm – no line, no stress. I went to Adam’s side inside the circle. I ran into my friend Mike, my oldest U2 friend – we used to go to all the U2 shows together on ZooTv and Popmart and spend hours and hours watching U2 footage. Mike and I decided to go over to Edge’s side. It was a good opportunity for me, since I wasn’t with Tasha (big Adam fan). Edge’s side was more crowded, so we were actually a little bit behind the stage on the side. 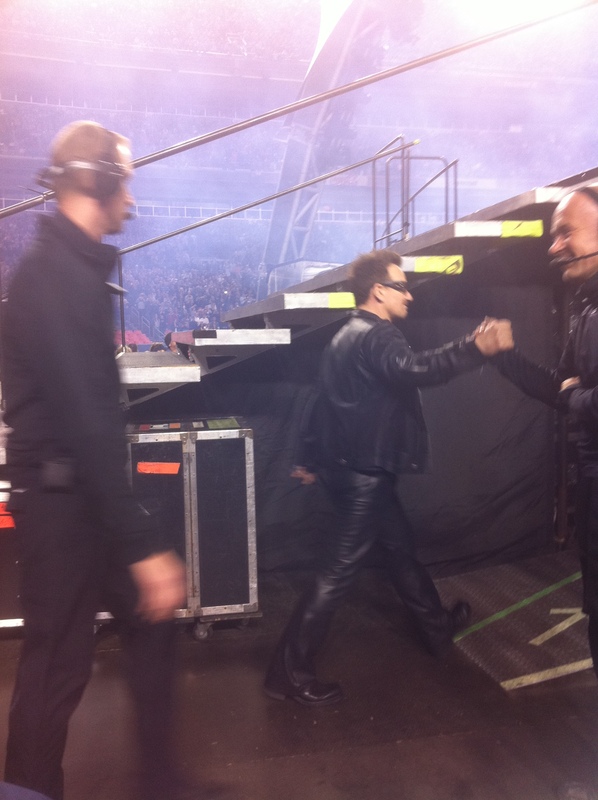 But I didn’t mind because I was going to go behind the stage a lot anyway to watch Larry – and when Bono and Edge went back there. 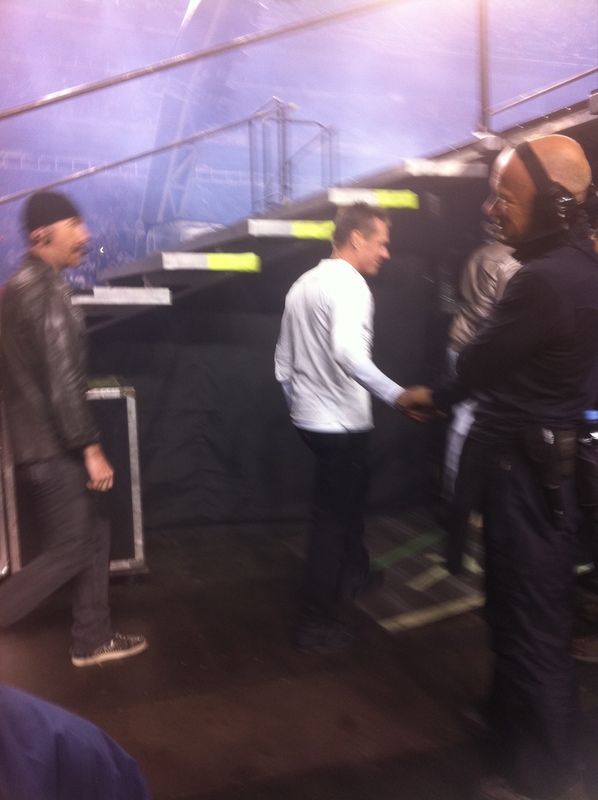 I went went behind the stage to wait for U2 to arrive and watch them walk in. It was great. They don’t go up the stairs to the stage, they go under the stage, which makes them even closer to the fans standing there watching. 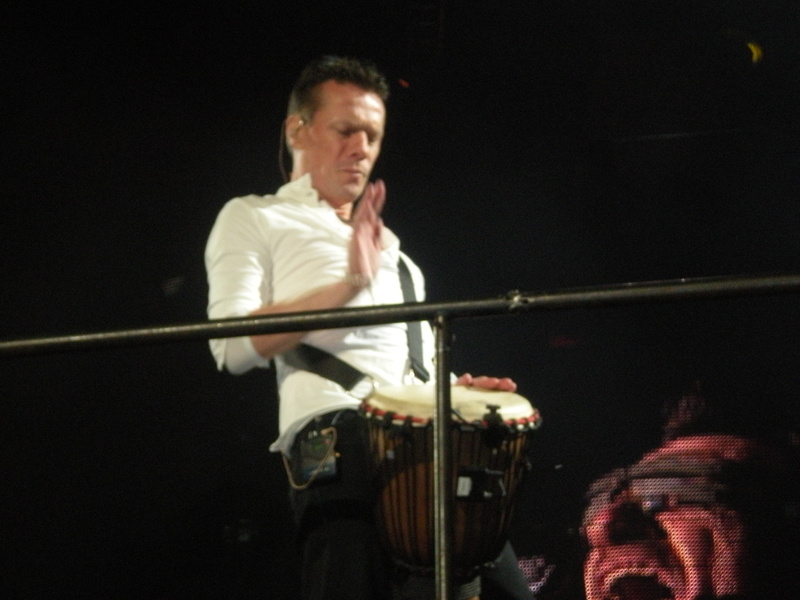 I called out to Larry (of course I’m wearing my Larry Mullen Band shirt), and he looked into my eyes, nodded and smiled at me before going under the stage. 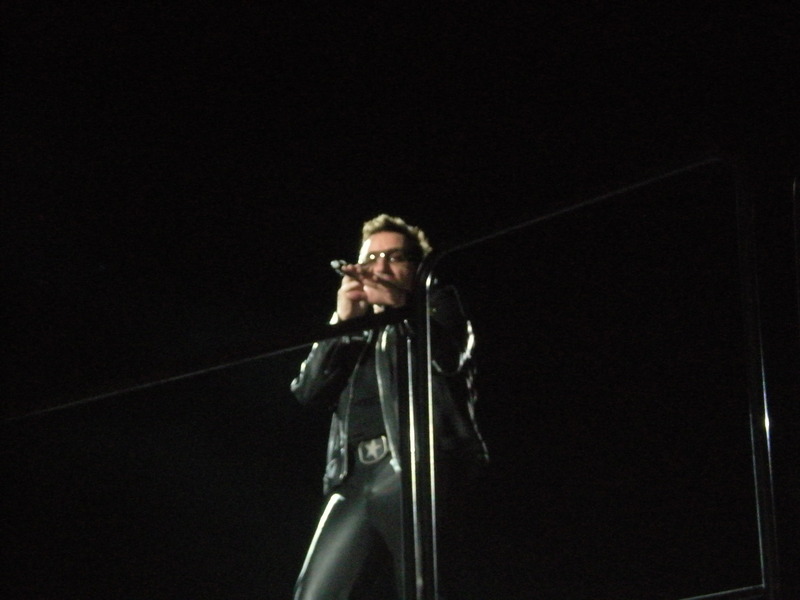 Bono talked quite a bit during this show, which is why it lasted over it’s normal 2 hours. He talked about how the tour was postponed last year because one year ago on May 21st he had back surgery. Bono talked about the supposed ‘end of the world’ on May 21st during ‘Until the End of the World.’ He thanked the U2 crew and even brought out Dallas to take a bow. Larry and his drums rotated around on 3 songs this time, as opposed to the 2 times he turned around on 360 in 2009. 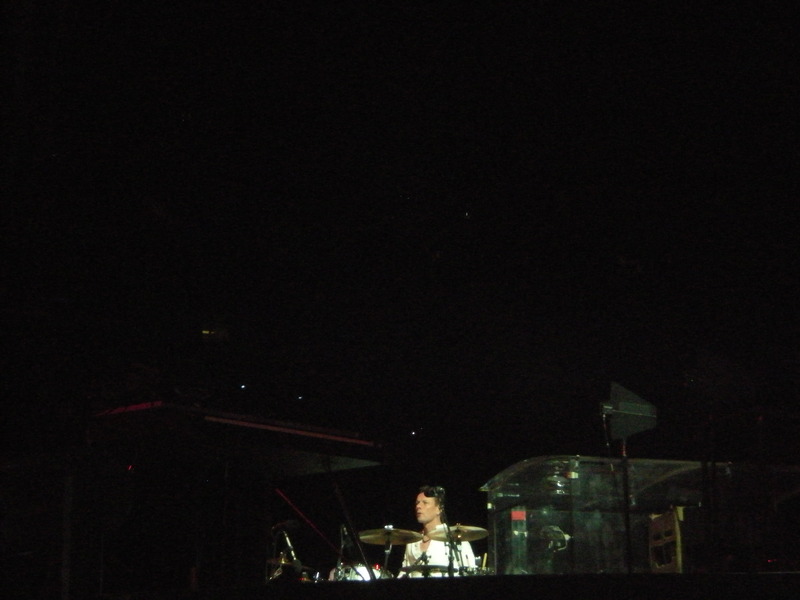 He turned around and faced the back of the stage during Mysterious Ways, All I Want is You, and Sunday Bloody Sunday. Of course I went behind the stage each time. As I did when Larry started back for I’ll Go Crazy if I Don’t Go Crazy Tonight. He again saw me and smile and nodded. 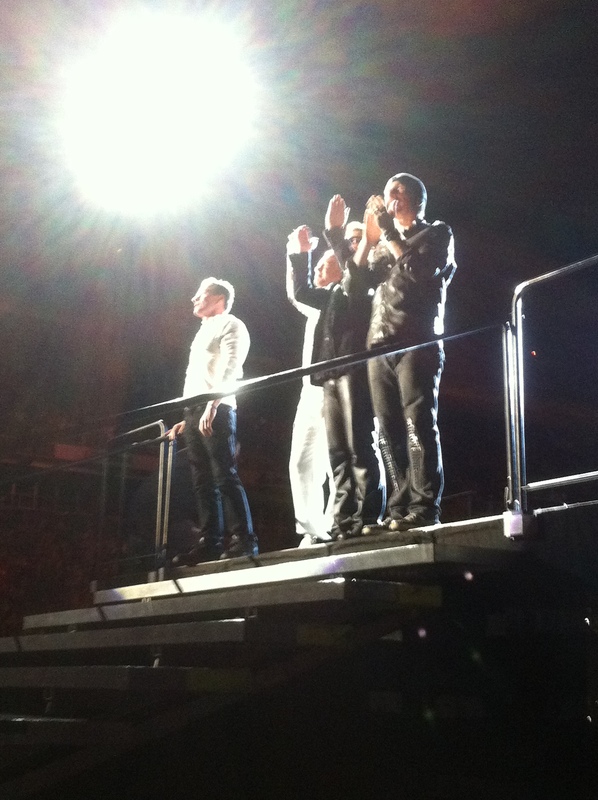 I went back behind the stage during Moment of Surrender to watch U2 leave. I called out to Larry as he was walking away, and he turned and smiled at me. 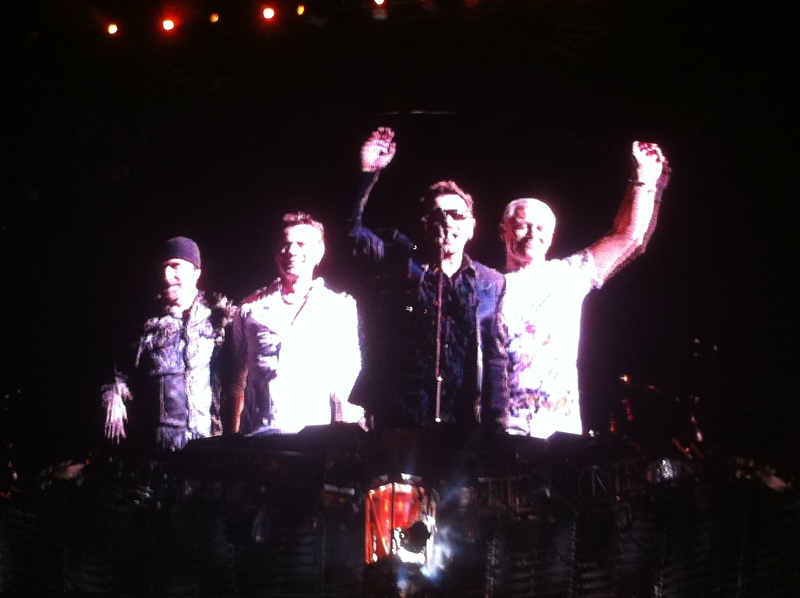 U2 360 in Denver was a great show. A great set list, but I thought the audience could have been more enthusiastic. It was a very relaxed show for me because I didn’t wait in line all day and didn’t have to stay in a certain spot once inside the stadium. I’m glad I got to see the show from Edge’s side for once, but there was a lot of smoke because the smoke machine was on that side. I’m going back to Adam’s side for Salt Lake City. 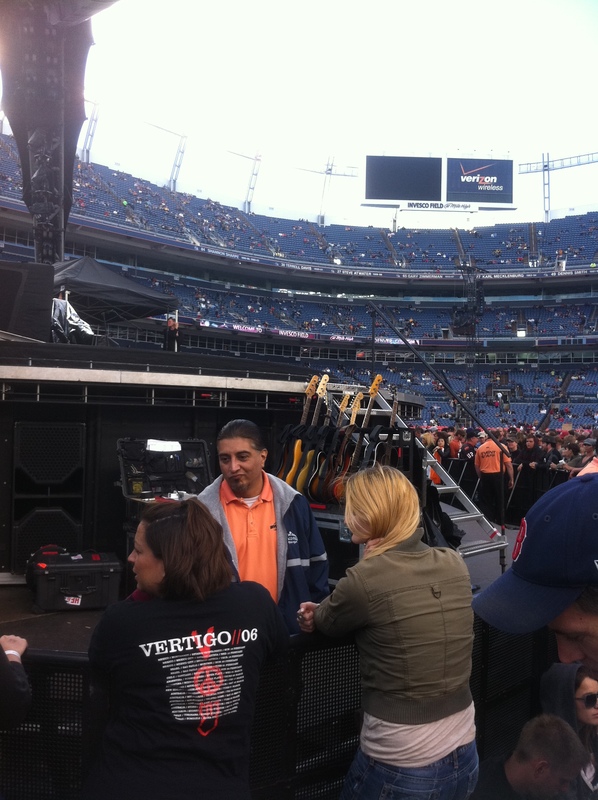 It was great to actually be on the field where my Denver Broncos play – that made the U2 show even more special for me. I have been a Broncos fan as long as I have been a U2 fan – over 24 years. The set list for U2 360 in Denver 5.21.11 was as follows: Even Better Than the Real Thing, I Will Follow, Get on Your Boots, Magnificent (remix), Mysterious Ways, Elevation, Until the End of the World, All I Want is You, Stay, Beautiful Day / Here Comes the Sun, Pride, Miss Sarajevo, Zooropa, City of Blinding Lights, Vertigo, I’ll Go Crazy if I Don’t Go Crazy Tonight (with Discotheque and Please snipets), Sunday Bloody Sunday, Scarlet, Walk On / You’ll Never Walk Alone, One / Will You Still Love Me Tomorrow, Where the Streets Have No Name, Hold Me Thrill Me Kiss Me Kill Me, With or Without You, Moment of Surrender.